Teachers! Where would our kids be, and even us if we didn’t have teachers? Let me start off by saying I’ve met some pretty under-qualified teachers who really don’t enjoy what they do in the past but there have always been a few that my kids get that I would give the moon to if I could. Those teachers, we owe everything to! Those teachers I think deserve not only our extreme gratitude but a little gift every now and again, am I right? 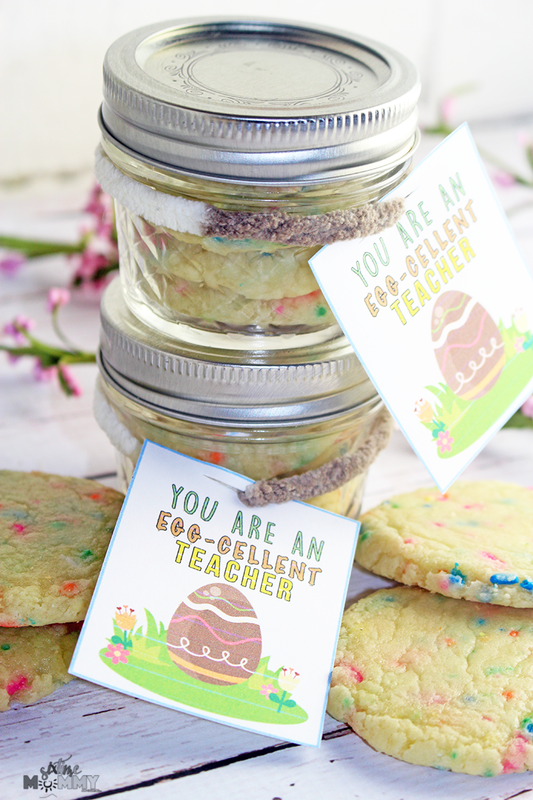 For Easter, I decided to make some little treats for the amazing teachers out there. I made THESE amazing cookies, please go to her website once you see these you’ll want to make them. Trust me. Don’t they look amazing? 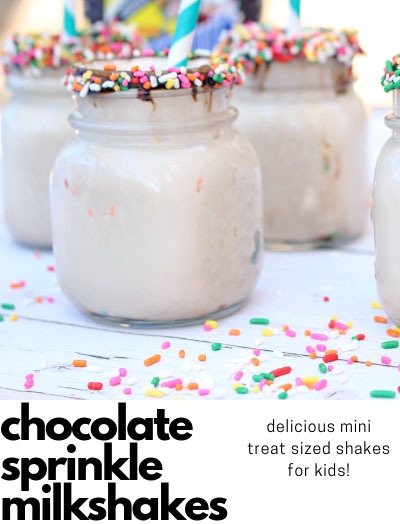 They are Sprinkle Pudding Cookies. They are soft and oh so dreamy. I decided to make this more of a personal gift — sometimes homemade is the better way to go! These cookies I think are just perfection and I know a few teachers who deserve endless amounts of them. 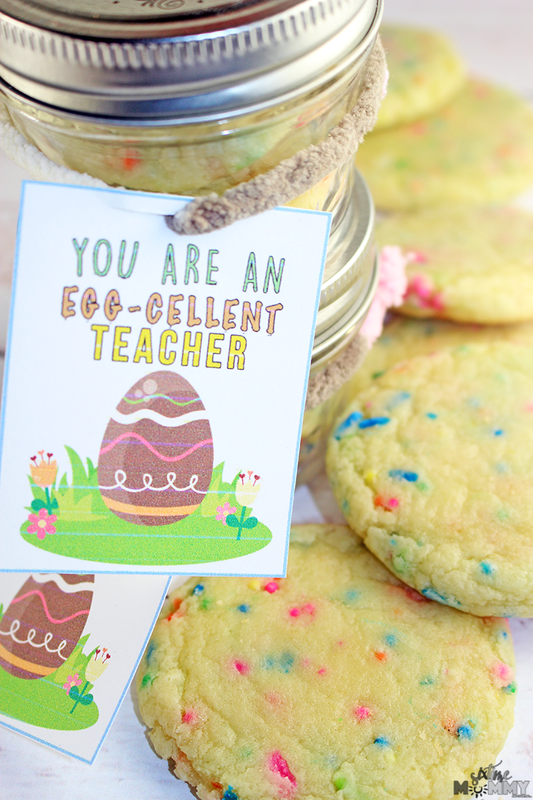 For this little gift, I created a printable card that reads, “You are an Eggs-cellent teacher!” because well, eggs and Easter! So cute, and of course a cute little saying goes a long way when personalizing these little treats. Although my printer is awful, I really love coming up with these fun printables to offer. I’ve heard from quite a few people that they print them off and always look forward to the new ones coming, so I have been working hard coming up with different card ideas, crosswords, word hunts, etc! To make this I bought some Mason Jars. They are rather small, only 3 cookies can fit into each which I think is just perfect for a sweet treat. I bought yarn that had pink, brown and white to go with the card (brown egg) I slit a little slit in the card, put the yarn through and tied it around the mason jar. 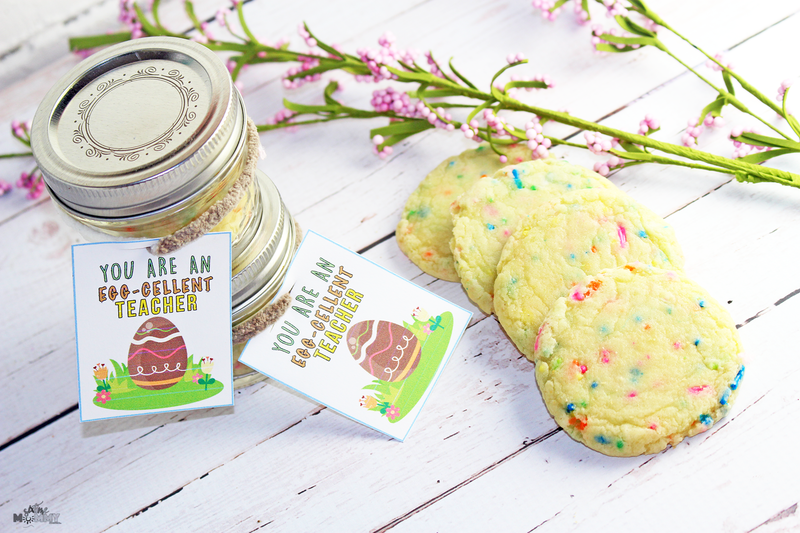 Not only can your favorite teacher enjoy a nice sweet treat but they can also reuse the mason jar, as doing this project doesn’t ruin the jar! I was worried about making cookies I had never made before but I worried for nothing. 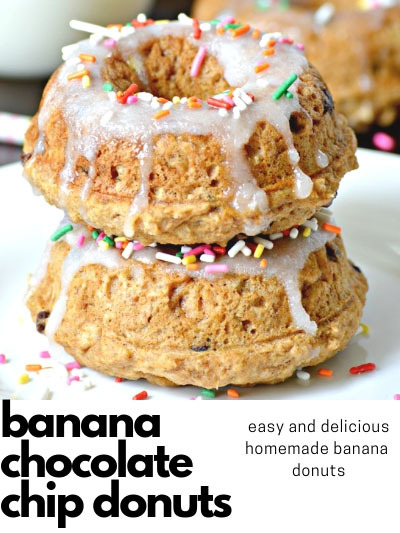 These were loved by everyone in the family, even my husband. He isn’t much of a sweets person so that says a lot! The Mason jars were on clearance at Walmart two for $3 and I bought card stock in bulk so this whole project, done with items on hand and only having to buy the small batch of yarn ($2) and mason jars ($3) came to $5. 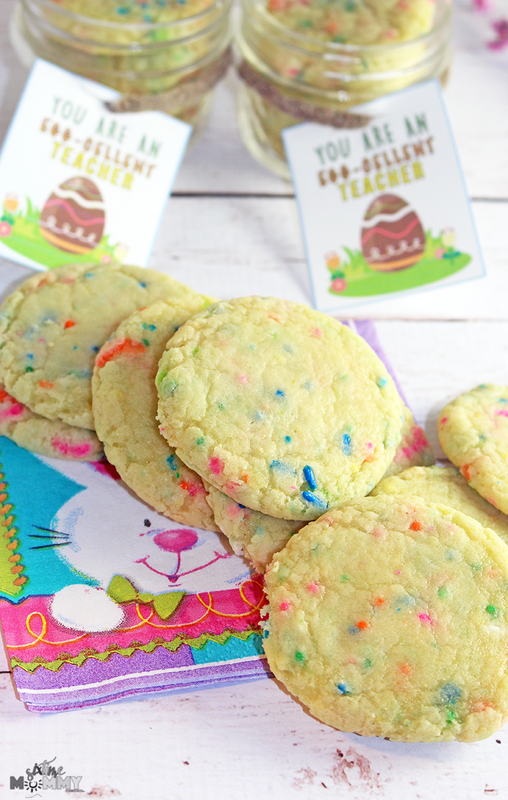 The cookies made a batch of 24 so there is plenty left over for you to enjoy too! COOKIESSSS — You, of course, can do this with any cookies but THIS recipe, you’ll want to try! When you print off your printable make sure your ink isn’t running low like mine is (oops)! So you get a flawless card. I have been doing printable cards for a few months now and everyone we give them to just gushes over the fact we thought to do homemade. This Easter we are doing what we always do. Hanging out at home just us, having a yummy dinner together and enjoying each others company. We will probably add a movie or two in there, as that seems to really go hand and hand with holidays around here and I am really looking forward to the holiday with my family. 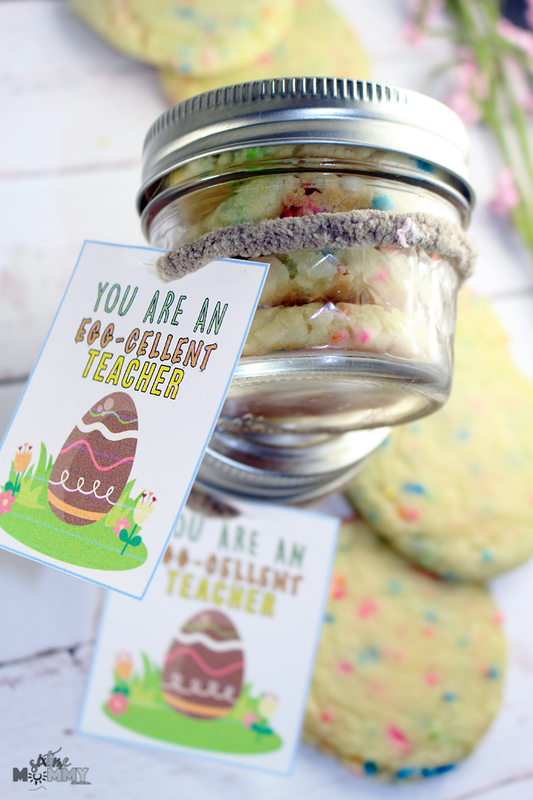 FREE EASTER TEACHER CARD PRINTABLE! DOWNLOAD YOUR FREE PRINTABLE — HERE!